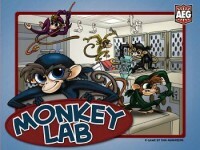 Monkey Lab is a strategic, fast, and cunning game for the primate in all of us. Roam the halls of a testing facility, prying, cracking, and smashing open cages of lab monkeys while you dodge the guard. 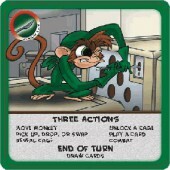 Use teamwork, guile, and strategy to save your fellow simians from the Monkey Lab! Rescue the most to be the victor in this game of monkey mayhem! First off the good. This game has good graphics and very heavy stock used for the pieces. The pawns are nicely molded monkeys in a cartoon style. Same with the large blue guard piece. Graphics are very cartoon like which is good for kids. Game play is very very simple. You pick three actions and draw up your cards and your done. Now the bad. Game play is VERY VERY simple. I played this with my fourteen year old son and he was completely bored with it. I would say if you have a child less than nine or ten then they would be ok with it but for adults or older kids they will get bored with it fast. Minor strategy involved but most of it revolves around who ends up going first. Add a Review for "Monkey Lab"